Yesterday Vladimir Putin gave his first Press Conference regarding the Crisis in Ukraine and his of Russia's role there. As with most such occasion, there are a multitude of body language tells here. Below are just two - yet important nonverbal moments of the above edited video. One very important factor helping to differentiate between subtle to mid-levels of anger vs. more elevated anger are the position of eyelids. Here at the 1:04 mark, note that Putin's eyebrows are lowered and his eyelids are partially closed (narrower vs. his normal resting eyelid position). Notice also the tension of the lower eyelids and mild tension of his mid-face. In this image, only 4 seconds later, the Russian President's upper eyelids have opened significantly - wider than his resting/baseline state. His lower eyelids exhibit increased tension and are also opened further (as his brows are lowered even more). 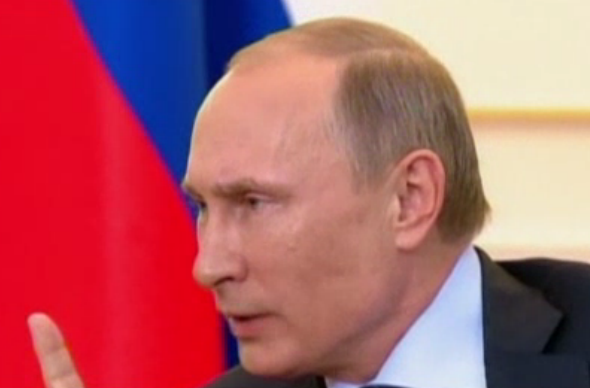 Note that Mr. Putin's mid-face is considerably more tense. Specifically there is contraction of his "mustache area" and dilation of his nostrils (only left one is visible). 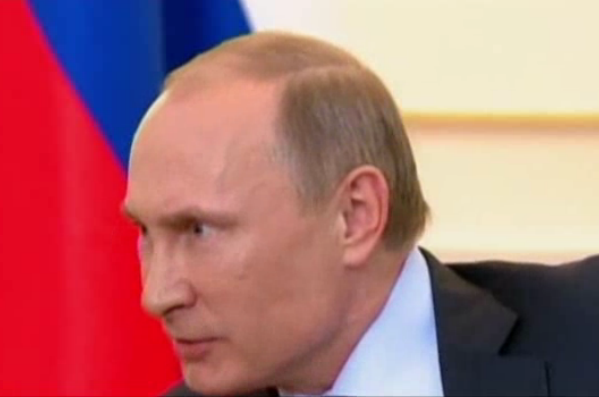 What does the change in Mr. Putin's pupils diameter (vs. the above image) indicate in this moment? The veins in the President's forehead/temple region are also more (and subtly visible in his neck as well) dilated/congested in the lower picture compared to the upper image. This finding indicates the relative increased intra-thoracic and intra-cranial pressure consistent with a Valsava phenomenon associated with Vladimir's (or anyone's) elevated anger level. What other body language signals do you see in this short by very telling video? Nonverbal Communication Analysis No. 2647: Vladimir Putin regarding Edward Snowden, What Does the Russian Leader Think?